With the advent of spring in Banff National Park comes a plethora of nature photography opportunities: bears are wandering the valley bottoms, prairie crocuses are shining brightly on the mountain slopes, and fresh leaves are poking out all over. But spring also heralds a time for landscape photographers to get serious in Banff as the snow and ice finally disappear from the mountain valleys and lakes. Banff National Park is one of the world’s premier landscape photography destinations, and for good reason. 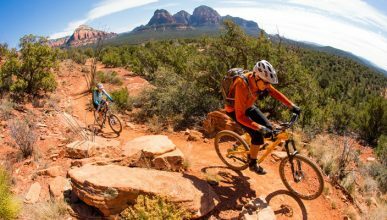 It boasts many of Canada’s finest and most well-known photography locations: Mt Rundle and Vermilion Lakes, Castle Mountain, Lake Louise, and the crown jewel of Canadian landscape photography, Moraine Lake and the Valley of the Ten Peaks. Last week, Herbert Lake and Waterfowl Lakes on the Icefields Parkway became ice free — at least a week earlier than normal. So that means that we are probably on pace for an ice-free Moraine Lake a little earlier than normal this year, maybe even by the end of May if we’re lucky. 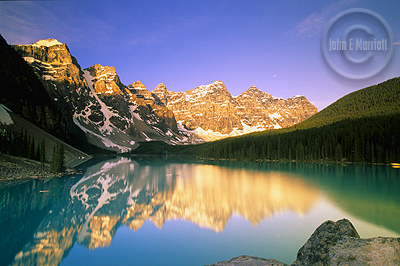 The scene at Moraine Lake is a classic and it can be photographed from a variety of angles. The best time of year to capture sunrise there with some light on the lake water is in June, before the angle of the sun changes enough for the mountains directly west of the lake to block most of the early morning light from hitting the lake itself. Sunrise is still great after that first good month, but the alpenglow will only light up the peaks in the background. By July and August, the best reflective light is actually at about 11 a.m. in the morning, when the sun finally crests the towering peaks to the west and shines down on the lake. 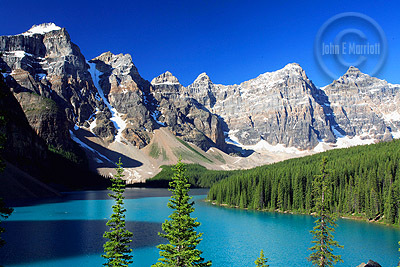 That’s when you’ll get the classic shots of the emerald blue water framed by the sunlit Valley of the Ten Peaks. Note that morning is the best time of day to photograph Moraine Lake. By late afternoon and evening, the mountains behind the lake are in shadow and do not provide the same dramatic backdrop as they do in the morning. Good luck out there, and happy shooting! Just as beautiful as we remember it fromm last year. 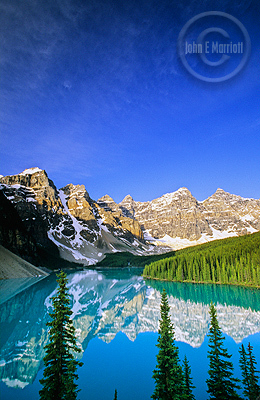 Wow, what beautiful pictures of Moraine Lake! Your last picture with the mountains reflecting out of the water..was that picture taken at 11am as you mentioned is the best time or when was it taken and what month?! I would love to go down there at whatever time and date you were there for that picture – simply breath taking, can’t wait to see it for myself one day soon!